Since the concept of space tourism began, as early as the late 50s when exploration beyond earth was dramatically coming into realization, there has been an ongoing debate about the ethics of space tourism. Questioning whether the world’s most exciting journey should be made available to tourists based on their ability to purchase high-price tickets rather than aspiring explorers who have dedicated their lives towards pursuing the romance of the great night sky, those opposed also reason that resources should not be spent on space travel with pressing issues on the ground demanding attention instead. Inevitably, the tide continues to flow in favor of entrepreneurial gurus with the influx of high-profile tourists whose next endeavour lies just beyond the stratosphere; one of the world’s best-selling sopranos is among them. 52-year old Sarah Brightman is currently in training at the Yuri Gagarin Cosmonaut Training Centre near Moscow, taking steps towards fulfilling her dream of venturing closer to the stars. The versatile crossover artist, actress, and composer has themed much of her work on folklore surrounding the moon and sky, particularly in her album La Luna in 1998 and recent release Dreamchaser. Brightman can be considered an ideal candidate for a space tourist given her passion for space as well as a high fitness level, but most importantly for her work as a UNESCO Artist for Peace. If her training is successful, the singer hopes to use her mission as an inspiration to young women, promoting empowerment and sustainability among the global community. 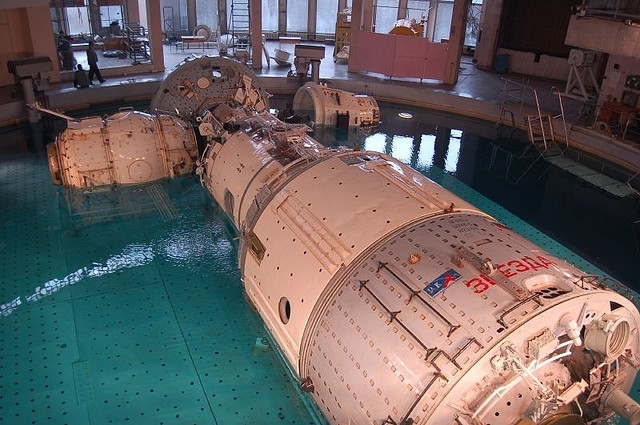 IS module mock up at the Cosmonaut Training Center (Credits: flickr.com/photos/katieandmichael/). This wouldn’t be the first time that a space initiative carries a political resonance, but it becomes a unique project for several reasons: a distinct popular figure who has taken on the role of peace ambassador, and who might even – though this is yet to be confirmed – perform for the millions of viewers who will watch her aboard the ISS, and who will theoretically become the face of Russian space travel, for a few years at least. Still in the midst of her Dreamchaser tour, Brightman has already begun preparing for this immense task, including intensive physical and psychological training. Though not undergoing the extent of rigorous and draining exercises that her fellow crew-members have been building on for years, Brightman has to learn how to handle potential emergencies and how to deal with PTSD should a trauma occur while in orbit. But many critics will question if Brightman is prepared to live up to her role as one of the newest and most iconic role models of her generation and the those that follow. 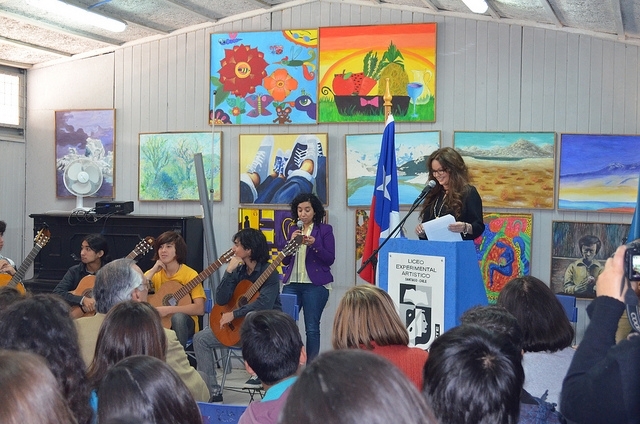 Sarah Brightman seen promoting the arts in Chile (Credits: UNESCO Santiago). Brightman’s emergence as a UNESCO Artist for Peace coincides with a tenuous period in Russian politics. With increasing focus on the upcoming Sochi 2014 Winter Olympics, Russia is striving to make its mark on the world as a successful and powerful entity. On the negative side, it is also coming under fire from the international community for its treatment of Greenpeace’s Arctic 30 and recent anti-gay legislation passed earlier this year. As these two events are measured up against both the social, cultural, and environmental ethics which UNESCO endorses, not only is Brightman’s role itself questioned, but the question of blurred boundaries between passive space tourist and outspoken activist, and just what function space tourism performs aside from putting large sums of money into research missions, prevails. Merryl Azriel’s deeply poignant and intuitive article on symbolism in space serves as an astute reference point indicating that what happens in space transcends the functionality of the mission in question and becomes its own mythological-like event, echoing a sense of pride and wonder in those watching from the ground. The sheer vastness of the solar system and the beautiful yet vulnerable vista of the Earth invoke feelings of great admiration for feats of courage and ingenuity in space tech, but also a sense of fragility. As the greatest frontier is slowly crossed by more and more people, carefully choosing how to represent a milestone, and with whom, is essential. If Sarah Brightman is able to take her place among crew members – and controversially in place of a top researcher, unless logistics can be resolved – then UNESCO has to question just what kind of “spiritual mission” it is backing. That isn’t to suggest that Brightman is not the right candidate or that her ideas do not hold weight, but there is a sense of a lack of focus which is overshadowed by the grasping of a great, abstract ideal of humanity. 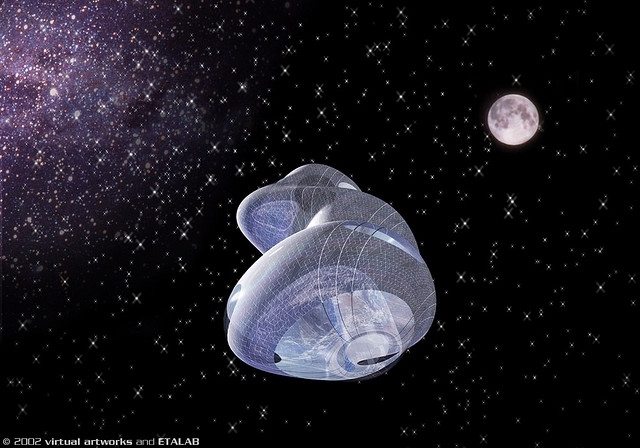 The connection between art and exploration is being explored by many, as in this vision for a Tate art museum located in space (Credits: Virtual Artworks and ETALAB/BBC Worlds News). In fact, although the connotations of tourism are changing (with the emergence of practices such as eco-tourism, etc.) there also remains the question of whether such an operation should be separated completely from the term “tourism” and if recognition can instead be placed on the value of perspectives and voices which emerge from creatives, who are the undesignated sounding board of their generation. Brightman is known for her highly-theatrical collaborative productions which are attuned to a certain standard of artistic expression, but she is not outspoken on politics. Perhaps this will not be an issue she will need to confront, but as UNESCO Artist for Peace, it seems slightly strange not to break the silence and show some solidarity for the very values which UNESCO professes to embrace, and to approach the social and political nature of her mission with an informed stance. Image caption: Sunrise for ISS captured by an STS-129 crew member in 2009. Sarah Brightman could be seeing this view live in a couple years (Credits: NASA).